Sorry for the delay in posting part 4. I've been a little busy lately but here it is. Part 4 goes over how to install GeoServer and how to publish a PostGIS database to it. Here I am using GeoServer 2.10.1 Installation was done on both a Windows 10 laptop and Windows Server 2012R machine for testing. There is more detailed instructions on the GeoServer site which you should read. The instructions were easy to follow, so there's no need to rewrite it so here. I'm just giving a summary of what I did. I installed both x86 (jre-8u121-windows-i586.exe) and x64 (jre-8u12-windows-x64.exe) versions. I found the installation process to be fairly easy. The only thing I had to do was make sure that the JRE path was correct. I have both the x64 and x86 JRE 8 versions installed - the default option during the installation process uses the path to the the x86 JRE (e.g. C:\Program Files \(x86\)\Java\jre8\). I left the path as the default since I want to run GeoServer as a service, which requires 32bit JRE (i.e. x86 JRE version\). Once the installation completes and if you're able access the Geoserver web admin page from the program menu or by opening a web browser and typing http://localhost:8080/geoserver/web then you're good. There are many GeoServer Extensions -- you should read about them and decide which one you want to install to extend the functionalities of your GeoServer. These are the ones that I installed on my GeoServer. They seemed to have been installed properly but haven't been fully tested out yet. There are tutorials on the GeoServer site you can explore. Printing Module - printing using Mapfish printing service. I installed this put haven't figured it out or worked with it yet. I will post my notes when I get it working. You can download the extension(s), here. Mark sure the extension(s) you download matches your GeoServer version, in this case it is 2.10.1. The Vector Tiles extension for GeoServer 2.10.1 can be found in the community-latest folder. With GeoServer 2.11 Vector Tiles is part of the core extensions. The instructions from the GeoServer site to install the Vector Tiles extension is for GeoServer 2.11 but it is sill applicable to version 2.10. You can read the instructions here. Basically you just download and extract the jar files for the extension and put them in the directory of your GeoServer’s WEB-INF\Lib folder (e.g. C:\Program Files\(x86)\GeoServer 2.10.1\webapps\geoserver\WEB-INF\lib\). After you copy and paste the jar files into the correct directory, the instruction guide (above links) says to restart GeoServer. That didn't work for me on my Windows 10 laptop. I had to restart my computer then restart GeoServer before I could see the added extension. The same thing happened on a Windows 2012R Server - I had to restart the server, then restart GeoServer and wait for a few minutes (up to 5 minutes) then refresh the GeoServer Web Admin page to see the extensions showed up. If you log into the Geoserver through the web admin page and click on a layer and then click the Tile Caching Tab you should see the vector tile output options that you just added to GeoServer. If the Importer extension installed properly then you should see a new tool, called Import Data under Data Section in the left hand side of the GeoServer web admin page. If the YSLD extension installed properly then you should be able to see the available format under Data >> Styles >> New Style. With this extension, you can style layers in YSLD and SLD formats. As you can see from the example below, I've also added the CSS extension for styling layers in CSS format. See link here for more information on styling in GeoServer. There are even styling cookbooks available to make it easier. 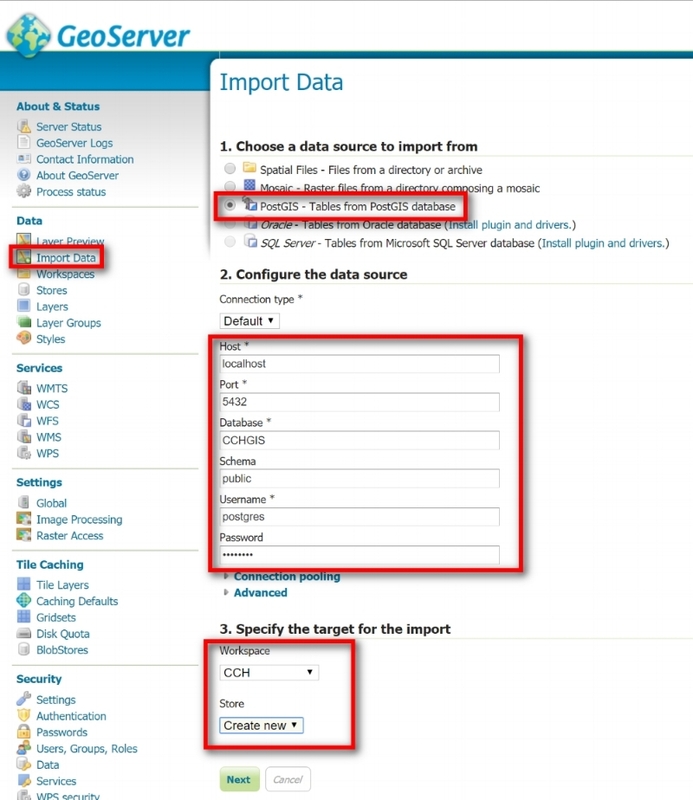 This section goes over how to use the Import Data tool to batch import a PostGIS database. Using the Import Data tool is a much easier option than having to use cURL command line option to do batching data importing to GeoServer. In the new workspace window that comes up, type in a name for your new workspace - limited to 10 characters and no spaces (e.g. CCH). For Namespace URI (Uniform Resource Identifier) this can be anything - according to the GeoServer site, a URI is similar to a URL except it does not need to point to an actual location on the web. It just needs to be a unique identifier, such as http://g70.design/geoserver/CCH. When you are done creating a new workspace, it's time to import some data into it. For this example, I'm batch importing some layers from a PostGIS database that I created earlier in part 3. In GeoServer, click Import Data. Then in the right hand panel, 1) Choose PostGIS as the data source to import from; 2) Under Configure the data source: fill in the appropriate information to connect to your PostGIS database; 3) Specify the Target for the Import: fill in the appropriate info for your workspace and data store - you can use an existing data store or create a new. If you create a new one - the store name will default to the name of your PostGIS table (e.g. workspace = CCH, store = CCHGIS (which is the name of my PostGIS database). In the Import panel that comes up you should be able to see the PostGIS database you just connected to. Select the layer(s) that you want to import into the data Store. I think of the workspace as the directory and the store as a container for the data. Note: When batch importing I was only able to batch import layers that were on the same page. If I selected layers that were listed on page 1 then clicked to page 2 to select more layers then GeoServer only imported the layers I selected from the current page that I was on. This meant that I had to select all the layers I wanted to imported on page 1 then click Import and wait for it to successfully import, then go to page 2 and repeat the process, etc. Select the layers you want to import >> Click Import then want for the layers to be successfully imported before importing more layers on page 2, 3, etc. See Note above. If you go to the Stores panel, you will see the newly created Workspace (e.g CCH) and the Store (CCHGIS, which is also the name of my PostGIS database). If you click on Layers in the left hand panel, you will see the layers that were imported. Notice under Name, it is the workspace name followed by the layer name (e.g. CCH:park) and the Store is CCHGIS. You can also preview the layers by Clicking Layer Preview in the left hand panel then click OpenLayers (under Common Formats heading). Notice that the layer is given a default feature color. Below is an example layer preview of the park layer with polygon features shown in gray (default color). Styling layers in GeoServer can be done using SLD, YSLD, or CSS. See the GeoServer Styling Workshop for more info. Supposedly you can use QGIS to create SLDs – this would be an easy option, however, when I tried it using QGIS 2.18.3 it didn't work. Out of curiosity I also tried exporting an SLD using an extension in ArcGIS, called Arc2Earth - this didn't work either. So for now I guess the best way to create and edit styling in GeoServer is directly edit XML or use the GeoServer style editor. Click on Styles in the left hand panel then in the right hand panel you can either Add a new style or click on an existing style to edit it. Notice there are already default styles for the layers I batched imported (e.g. CCH_citynopass, CCH_coastline, etc). You can either delete then and create new ones or edit them - whatever you prefer. Below is a snapshot of the New Style window. Choose a format then either upload an existing style file or use the Style Editor to write your own styles. I highly recommend reading the GeoServer Styling Section. It has lots of useful info, including "cookbook recipes" you can copy and edit for your purpose. Here is a sample of a style in YSLD format I created for a zoning layer. Notice under Format, you can't change the format from one to another (e.g. can't switch format from YSLD to SLD). Also notice there are 3 tabs: Publishing, Layer Preview, and Layer Attributes -- these are shown below. With the Publishing tab you can select which layer the style is associated with and whether it is the default style for that layer. Here I am associating my CCHzoning style to the zoning layer and making it the default symbology. The Layer Preview tab gives you a preview of your style. Any changes/edits made in the Style Editor will be reflected in the preview. Notice where it says "Previewing on layer: CCH:zoning_luo" - make sure this corresponds correctly to your style. I've had it where maybe I forgot to check of something and I'm not previewing on the correct layer (i.e. Previewing on layer: CCH_TMK but my style is for zoning so nothing shows up in preview). If this happens, you can click on the layer name and then you can select the correct layer. Make style changes/edits using the Style Editor to see a preview of what changes will look like. You may have to click the Apply button to see the changes. Use the Validate button to help you "debug" your style structure. Use the Submit button to finalize/save the changes. The Layer Attributes tab will allow you to see the attribute field names, and type associate with the layer. It takes a bit of work to do the styling but it's not that hard to do. It's just a hassle and not as easy as just being able to use SLD created in QGIS. I'm hoping the SLD from the next version of QGIS will work with GeoServer. Once you've create styles for your layer then the next thing you'd want to do is publish them as WMS, WFS, etc. Click on Layers in the left hand panel then select a layer to edit its properties. There are 4 tabs: Data, Publishing, Dimension, and Tile Caching. I would suggest reading up on all the options within these tabs to properly configure and publish your layers. Don't forget to click the SAVE at the bottom of each tab after you make your changes. The Data tab, shown below is basically the metadata for your layer. Fill in any input that is needed, make sure the layer is enabled though. The Publishing tab allows you to edit the WFS and WMS settings for the layer. Notice the default style for WMS is the zoning style I created earlier. The Dimension tab allows you to enable a time and elevation dimension if your layer has these properties. The Tile Caching tab is where you can create caches for your layer. and select the tile image format. Notice you will not have these formats: geojson, topojson, utfgrid, or mapbox-vector if you didn't install their respective extensions. Once your layers are published you should test it out to see if your GeoServer services are working by trying to call them in a web mapping application or in a desktop GIS software (e.g. ArcGIS, QGIS). Below are some examples of my GeoServer services as shown in a Leaflet and Open Layers web maps, and in ArcGIS and QGIS. My GeoServer added in ArcCatlog with a preview of the zoning layer. This post documents my attempt at implementing opensource GIS Desktop and Server. It describes the trials and errors of the process. It may or may not work for your purpose, but I hope others will find it useful in terms of knowing what is involved. This is the open source GIS software stack I used. Part 1: Installing QGIS. This is just the installation of the opensource desktop GIS, QGIS, which I've already written a document on how to do this. Although it is for QGIS 2.14 the process will be the same for the current version 2.18. Part 3: Creating a PostGIS database. This part goes over how to import an ESRI file GDB to a PostGIS database using ogr2ogr command line utility. Part 6: Using Leaflet and OpenLayers to test that layers GeoServer can be called. I tried OpenGeoSuite 4.8 (free version from Boundless but require email sign up) which was really easy to install and used. The version of OpenGeoSuite I tested uses slightly older versions of GeoServer and PostgreSQL/PostGIS. I wanted to use more current versions of the software in the stack as well as wanting to know how to each component worked, so I tried my hand at implemnting each components of the stack myself. Of course it's not as easy as just using OpenGeoSuite but at least I learned a lot in the process. Here are the specs on the machines that I tested. Installation of Postgres/PostGIS on both a Windows 10 OS x64 laptop and a Windows Server 2012 R2 virtual machine for testing. The Windows Server VM already has a web server (Windows IIS) already set up at my work by IT so I used that. Also for my laptop I just used/enabled the Windows IIS already available.